In stock -This product will ship today if ordered within the next 4 hours and 0 minutes. A sweet mango fragrance with a relaxing tropical vibe. PureAire Essences contain essential oils. Made from botanical extracts and contain vital oxide disinfectant which has antibacterial and anti fungal properties. They are non-toxic, non-flammable, alcohol free, biodegradable and environmentally safe. Vital Oxide is EPA registered hospital disinfectant cleaner, mould killer, and super effective odour eliminator. Non-irritating to the skin, and non-corrosive to treated articles. Vital Oxide is a broad-spectrum antimicrobial that performs against a wide variety of bacteria, yeasts, viruses, fungi, spores, moulds, mildews, and other microbes. It is effective at low concentrations, over a wide pH range. Shake well before use. Add 2.5-5 ml to approx. 1.5l of clean water in a PureAire Revitaliser. Store in a cool, dry place & keep away from direct sunlight. 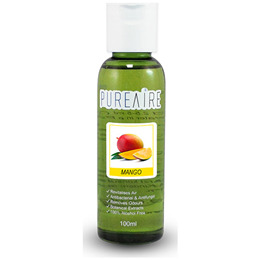 Below are reviews of PureAire Air Purifier Essence Mango - 100ml by bodykind customers. If you have tried this product we'd love to hear what you think so please leave a review. A sweet mango fragrance with a relaxing tropical vibe. PureAire Essences contain essential oils. Made from botanical extracts and contain vital oxide disinfectant which has antibacterial and anti fungal properties.